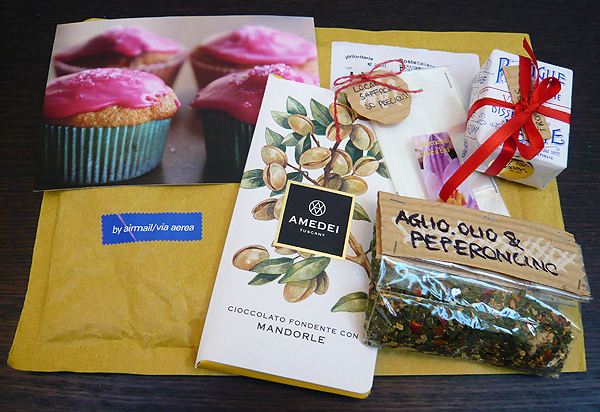 I recently caught wind of the foodie exchange – a kind of pen pal system for international food lovers where edibles are exchanged instead of words. It would seem that British treats are pretty popular as within days of joining I had scores of requests. I’ve had to spread out the swaps I’ve agreed to as the postage is punchy (had to repack one particular parcel after being quoted postage of £25), but it’s been fun putting together the care packages…and even more fun receiving them! This week I had the pleasure of receiving not one, but three, very lovely packages – one from Juls (Juls Kitchen) in Tuscany (above) another (below), from Andrea (High/Low Food/Drink) in New York, and the last (which arrived just this morning, shown last) from Evelyne (Cheap Etnic Eatz) in Montreal. Having only received Jul’s package a couple of days ago I’ve not had a chance to sample its delights, which included: a tempting bar of Amedei Dark Chocolate with Almonds (that won’t be around for long! ), a pretty box of Leone Vanilla Sweets, some dried Garlic, Chilli & Parsley Pasta Seasoning and delicate strands of Italian Saffron. I’m already planning meals around them – the saffron in particular is going to come in handy for this month’s Daring Cooks challenge! Andrea’s on the other hand, I dived right into the Monday it arrived – her generous selection definitely helped chase those Monday blues away! B and I demolished the cute mini cakes – a light crumbly Ronnybrook White Chocolate Almond Cake and Fat Witch Bakery‘s brownie and blondie. They were all delicious but the fudgy chocolate brownie was a clear favourite…until I tasted the Jacques Torres A.M. Quickie that is! The Milk and Dark Chocolate Cereal (crushed up rice krispies, cornflakes and raisin bran) Bar tasted kinda like feuilletine and was seriously yummy! Initially I wasn’t so sure about the nutbox yogurt pretzels but they’re definitely a grower and I’ve had to put them away as I kept reaching for the bag! I have yet to try the fantastically touristy NYC taxi treats (cookies), Pomegranate White tea and the highly anticipated Mamoun’s Hot Sauce as I’m trying to space out the goodies, but no doubt they will be wonderful too! Evelyne’s package contained some items quite foreign to me – the Poutine Sauce Mix (which I believe is to top off french fries) is quite intriguing, as is the “Bolets” from Gaspésie, a variety of dried wild mushrooms that I’m still trying to find out more about on the internet, but am sure would be beautiful in a risotto. 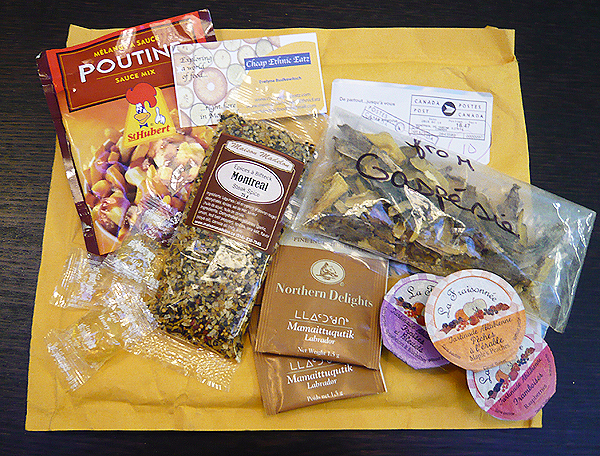 She also included a packet of Montreal Steak Spice, a few sachets of Mamaittuqutik tea, little pots of fruit jams and some honey sweets. A real eclectic mix that I am excited to create a few meals from! Thanks Juls, Andrea and Evelyne for your very different but equally lovely packages! ~ by gourmettraveller on February 21, 2010. Looks like fun! I’ve sent a few things to others around the globe but usually am stuck as to what to send back. What did you find yourself sending? Oh, and poutine is lovely. :) Cheese curds and gravy on french fries. It is difficult, I ended up posting a lot of sweet things (clotted cream fudge, jaffa cakes, tunnocks caramel wafers, bakewell tarts, cadbury’s etc.) and tea! Yea! 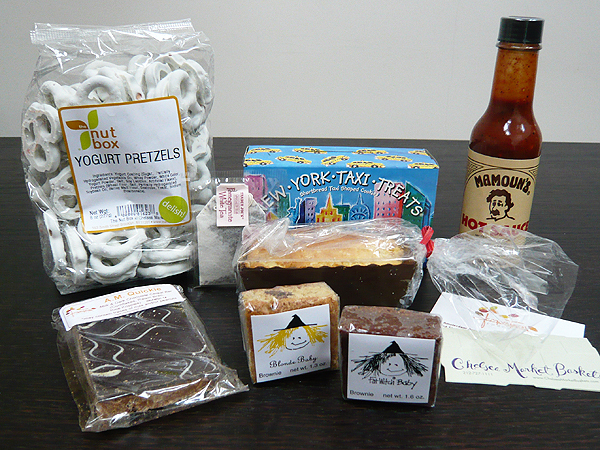 So glad you enjoyed all of the goodies from NYC and hope that you’ll come visit them in person one day! Yay for the foodie exchange!!!! ciao! would you like to exchange with me? i’m from italy, pls feel free to contact me through my blog http://viaggiando-mangiando.blogspot.com/ wait for you! What a great package you received from everyone.